After laying my plans and doing as much reading around as I can…. I still have so much more to do…. today is Cinnamon Bun Day and I officially begin my Year of Living Hyggely, making sure that I include as many moments of hygge as I can in my life; looking at all aspects of the way I live and hyggering them up, so that I can be as ‘happy’ as the Danes and doing all this in a very British Way. Spreading the filling on the buns. I’ll be using Danish recipes and finding British alternatives that have the same impact. I’ll look at different elements of Scandi living and finding the British equivalent. If imitation is the sincerest form of flattery, I’ll be imitating and adapting a Danish lifestyle to one that a British woman, living in the North, not cosmopolitan London, can follow. And I’ll be chronicling it here, every step of the way. 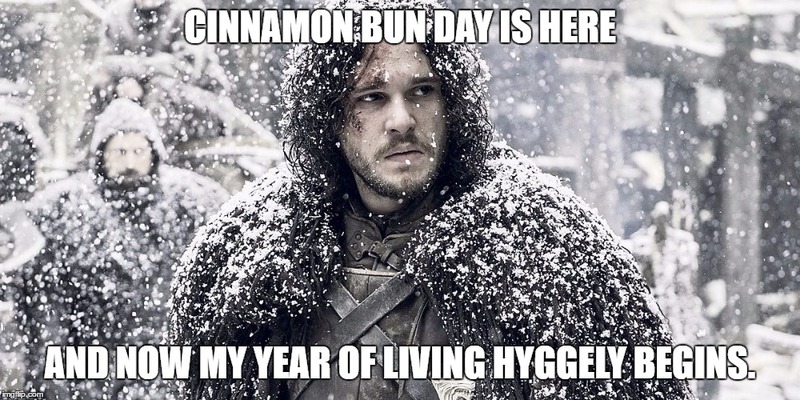 By next Cinnamon Bun Day, I hope to have spread the hygge message; that now is what matters, that happiness is achievable for everyone, and that we all have a role to play in promoting that. I want to be the first Official Hygge Ambassador. The Buns after their second proving and ready to go in. And I kicked my year off this morning with this Kanelbullar recipe from Scandinavian Kitchen… I tweeted Bronte Aurell first thing this morning to ask permission and got an instant ‘YES! Thanks x’ She’s so kind! Cream all the ingredients for filling together until smooth. *If using fresh yeast, add the warm milk to a mixing bowl and add the yeast; stir until dissolved, then pour into the bowl of the food mixer. Pour the warm milk into a bowl, sprinkle in the yeast and whisk together. Cover with clingfilm and leave in a warm place for about 15 minutes to become bubbly. Pour into the bowl of a food mixer fitted with a dough hook. Start the machine and add the cooled, melted butter. Allow to combine with the yeast for 1 minute or so, then add the sugar. Allow to combine for 1 minute. Once mixed, leave the dough in a bowl and cover with a dish towel or clingfilm. Allow to rise for around 30 minutes or until it has doubled in size. Dust a table top with flour and turn out the dough. Using your hands, knead the dough and work in more flour if needed. Using a rolling pin, roll out the dough to a 40 x 50 cm/16 x 20 in. rectangle. When you have done your twists, leave on a lined baking tray for 20-25 minutes to rise again. Heat the oven to 200 degrees fan. Brush the buns lightly with beaten egg, then bake for 6-9 minutes or until golden and done. While they are baking, make a simple sugar syrup: In a saucepan, heat 50ml water with 100g sugar until bubbling and completely melted. You can also use golden syrup and just melt it a big in a saucepan. When the buns come out of the oven, immediately brush lightly with the syrup, then add pearl sugar (nibbed sugar) on top of the buns and cover with a damp tea towel. the tea towel stops the buns from going dry. If you cannot get hold of nib sugar (pearl sugar), you can use chopped hazelnuts etc instead as an alternative. I’d love to see you all there; I love meeting new friends and it’s great to know that social media has made things like asking for permission to use a recipe so easy, and brought a wide, wide world closer together. Have a happy Bun Day! Go hygge yourself! The Daughter got into the photo; peace to you all. Thank you for popping by! Of course, you’re like 5 minutes from Ikea… do you use it as a local coffee shop? Hope you like the rest of my posts as well! How do you make the twists? So much prettier than regular rolled cinnamon buns. You roll the dough out about 16 inches by 20 inches, spread the mixture out and fold in half length ways (so it’s 8 by 20) Then you cut a strip across the width approx 1/16th of the whole thing. Take hold of each end and then turn, one clockwise and one anticlockwise, a few times. When you curl it up, it’s made the knot shape. Tuck the ends under so they don’t uncurl and, there you are. It looks harder and is harder to explain than to do! Well those look mouthwateringly gorgeous! Following your blog with interest 🙂 I may need to run more. Previous Previous post: Tonight is Kanelbullens Dag Eve. Next Next post: Is Hygge just mindfulness in a new, fancy Danish wrapper?